I am pretty sure we are at the beginning of my 2nd trimester. I can't believe it actually. Worth and I were just talking about how fast this has gone by and we can't imagine how fast the next 6 months will go. I would not mind if it actually slowed down! I know I will get there mentally about having a newborn but at the moment the thought terrifies me. It helps seeing several of my friends bring home there 2nd baby and how it just seems so natural and that life just goes on. I hope it is not as boat rocking and earth shattering as bringing home the 1st newborn! There are not many updates to give you with this pregnancy, no use in telling you all the symptoms of pregnancy, they are what they are. We are trying to tell BellaRose about what is happening but I am not sure she will fully know until I have a big ole belly and actually something to point at. It is hard for me to understand that there is a baby in there, I can't imagine what a 2 year old thinks! We head to our annual Outer Banks trip next weekend. I am so excited! We are going to a new spot this year, Buxton to be exact. I think it will be a little more secluded then Kill Devil Hills which suits me just fine. It is such a wonderful time to go, barring there are no hurricanes. So far so good. The weather is just perfect, not too hot and certainly not too cold. You can even wear jeans at night which after a long day on the beach is so very nice! 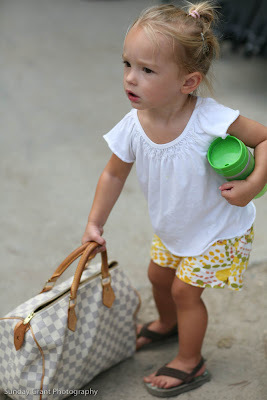 BellaRose also starts preschool next week for 2 days a week. I am excited but also stunned that she is starting. I really believe she is going to thrive. I got her a precious little lunch bag which she is already so excited about carrying. She has already filled it with tomatoes and handed them out to Worth, Bill and me. I hope this shows signs of sharing in preschool, I know that is a bit of wishful thinking! So I have not gotten to the reasons we do live in a great house, but the pictures below show BellaRose in our backyard which is a great thing about this house. 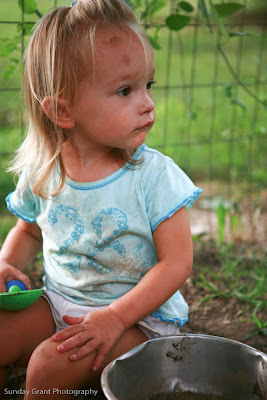 You can see BellaRose walking to the garden and sand/water table and her sand box. It is nice that I can open the screen door and she can go outside and I can work in the kitchen without fear of her getting hit by a car. The only annoyance is Rainy barking at her to throw the tennis ball and BellaRose does not seem to care it only bothers me I guess. Boy this is a long post, huh. I have not written in awhile and I thought I would not have much to say. I would love for you to check out my photo blog here of the lovely Hannah and a sneak peek at her bridals. I LOVE THEM! You will be able to see more in October after the wedding. 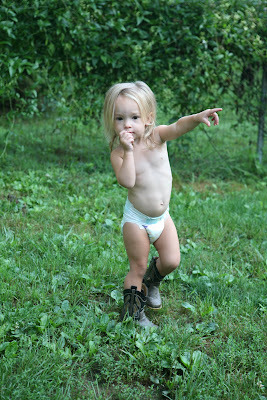 You will be happy to know that I did finally order some pictures of Sweet B-Rosey. It only took me a year! I am also thinking about having my blog made into a book. 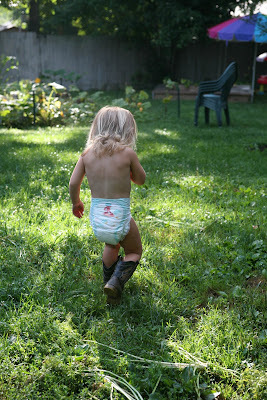 A few blog friends have talked about it and this blog has pretty much been a baby book for BellaRose filled with my favorite pictures. I think it will be worth it if I can find the time to go through 2 years of blog posts! I am back from what feels like another whirlwind trip to Atlanta. The days were packed, but so much fun! 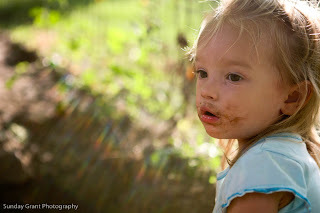 I had 3 portrait sessions booked while I was there, and they were all with my good friends' children. BellaRose tagged along with me, which is not usually the case, but she did great! Since I was "working" I did not take any pictures of just hanging out. You can go to my friend's blogs and see some really fun video and pictures. First go to Erin's, we met up with her son Walker, and our friend Catherine, and one of her sons Jack. We met at Chastain Park, pretty much the park I grew up in. It was so much fun being back there. I did not necessarily play on the jungle gym when I was younger, but instead galloped my horse through the field, which I am pretty sure is no longer allowed. I guess they think it might be a safety hazard (whatever). Now go to my friend Rebecca's blog. Her daughter, Emerson, and BellaRose are almost the same age. They had a blast together! It was so much fun seeing them play together. BR would get a little possessive of Emerson's toys and we had to have a few talks. Emerson is so cute, and I just wish you could hear her voice, it is SO raspy and so darn cute. She calls herself in the 3rd person too! Bec has a couple of videos up of the girls playing. While there I stayed with Sumner and Wes. 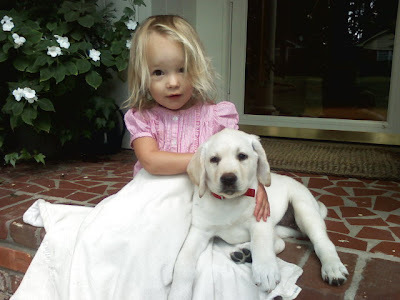 They had just gotten a puppy a few days before we got there. She is an 8 week old white lab. Her name is Georgia and BellaRose and I called her Sweetie most of the time. BRose was in heaven! It was so much fun staying with Sumner too! It has been years since I have done that and it just felt like old times. It was good to be "home". I also got to have lunch with my dad and visit with Grandma, phew! I told it was packed several days! 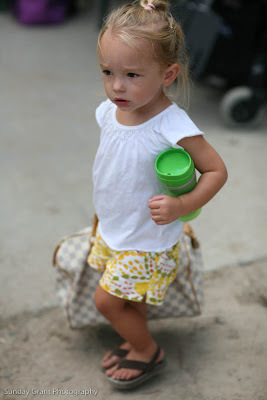 I did manage to get a picture of BellaRose carrying a Louis Vuitton. She is a girl after her mother's heart. I think that this should be in their ad campaign, forget Madonna! ... water near and far! Do you guys know what book that is? That is another one of BellaRose's books I have memorized now! 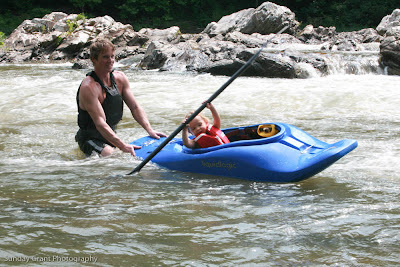 This past weekend we went to "Big Rocks" on the Nolichucky in TN right over the NC border. Worth and I used to go there a lot in college, well really Worth, I would go and just watch. 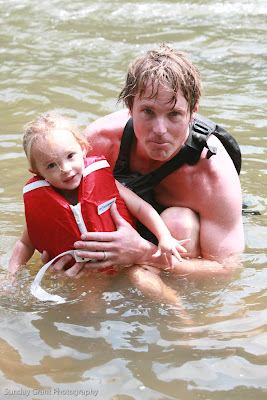 As you all know BellaRose is in love with water, as is Worth, so this was a perfect outing for the family. Worth put BellaRose in his boat and she LOVED it. She calls it a "nanyak". Again another cute word that she says! The smallest boat that "they" make out there is for 30lbs and up. Well BR has a little ways to go until we reach that goal, but by next summer we hope to have her in a boat! I am pretty sure that this picture of her in the boat will come back in several years when she is a world champion boater and people will be saying "look where she came from". Sort of like that picture of Tiger Woods swinging a golf club when he was her age. We went to the Doctor for #2 yesterday afternoon and everything went well. I was a little nervous, you know how it is, everything is so unknown and you don't really know what is going on in there. I am not showing, other signs of pregnancy are there, but you don't feel the baby yet and it is just scary times. Of course I think that the whole pregnancy is pretty scary times, thank goodness for prayer! So on my next post I am going to talk about all the reasons I should love my current house. I want to move SO BADLY, but that is not going to happen, so instead I am going to try to think about all the positives (big yard, low mortgage) of this house instead of the negative (too small, cluttered). I know you will love this personal journey for me! We are in full summer mode. The garden is producing like crazy. We are up to our eyes in tomatoes. I can't give them away fast enough (so please come get some). Worth came home last night telling me we were giving a lot of jalapenos to the local Mexican restaurant (Ole's for you local folk). I get so excited when we are able to give our produce to local restaurants. It feels like such an honor! We are also getting some big carrots. Worth planted "Big Top" carrots from seed. 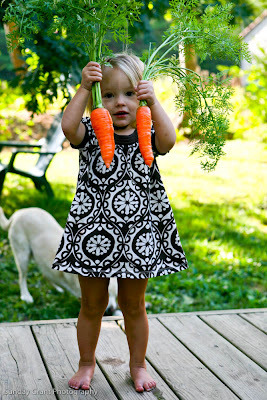 BellaRose LOVES carrots and she was so proud to show them off. The dogs, in their desperation to get away from the heat, have dug a massive hole in the yard, BellaRose has decided that is her new play spot and she would prefer that Worth play in the hole with her. It is quite a cute sight! We did celebrate Grandma's 95th birthday at my Aunt and Uncles house this past weekend. We had such a wonderful time hanging out with family and seeing their gorgeous new home. I just cannot believe my Grandma is 95! I will post pictures of that soon. I am so behind on pictures I just can't even stand it! You all know that pictures are my passion, but did you know I have not gotten any pictures of BellaRose printed since she was 11 months old! I have all these gorgeous pictures of her and nothing to show for it! BellaRose is doing amazing, having a blast of a summer. She loves the pool, and loves to jump in the deep in, have I told you she is fearless? She has also taken to calling her daddy, "Worth". She will ask me "Momma where's Worth". It is SO cute. He comes home from work and she yells "Worth!". I think he would prefer to be called Daddy, but will take what he can get. #2 is doing fine as well. It is the beginning of pregnancy and always scary wondering what is going on in there. I do feel different with this one and I really take advantage of BellaRose's nap time to take one for myself. I never did figure out the whole sleep when the baby sleeps deal when she was a newborn, but I have sure figured it out now! Praise the Lord for 2 hours naps!